MyImageConverter Toolbar is another invention from the Mindspark “toolbar team,” who seems to have endless ideas of how to make money by making useless and potentially harmful browser extensions. If you find this toolbar in your browsers, it is also possible that you are surprised and do not even remember installing it. No wonder, because this bad toolbar may sneak onto your computer with a company of malware infections. That is really bad news for you if you have no effective security tool protecting your PC. Before these malware threats start to run amok on your machine, you need to eliminate them all; and you need to start by removing MyImageConverter Toolbar first. For more details, please read the whole article. Similarly to all the other toolbars from this family, MyImageConverter Toolbar also has an official website. You can find it at myimageconverter.com. But what are the chance of finding it if you do not know the URL address? Do you think you can bump into its link on the first pages of a Google search? We do not think so. That is why it is much more probable that users encounter the bundled version. However, that version may also surprise you with a bunch of other malware infections. If you see a lot of third-party advertisements popping up while you are surfing the web, it is likely that you have adware apps on your computer. But browser hijackers are also common in such bundles. Have you downloaded free software lately? Have you visited shareware sites? That is how most users usually end up with such infections. And that is why you need to be more careful about what kind of websites you use as the source of your downloads. Since this toolbar uses such a suspicious method to spread, we definitely suggest that you delete MyImageConverter Toolbar from your system. 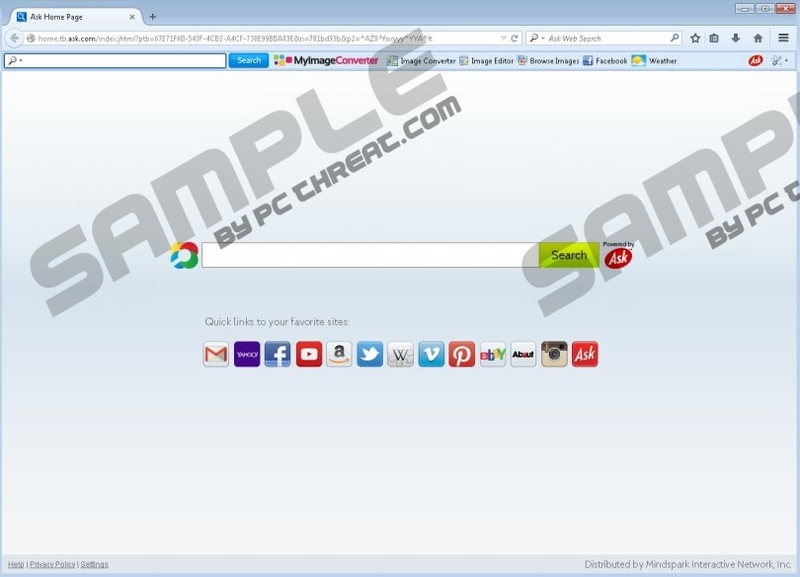 MyImageConverter Toolbar offers quick links to image converting-related third-party websites as well as a search tool. Once this browser extension is installed, it sets Ask.com as your new home page, new tab page, and default search engine. If you know any other Mindspark product, such as YourLocalLotto Toolbar and FreeMaps Toolbar, you also know that you cannot trust any third-party content you may be introduced to by this toolbar, including the websites that may be linked from the toolbar. This extension may also collect data about you and use that to inject tailored third-party advertisements and sponsored links through the third-party services it offers. But what if there are criminals out there posing as third parties? What if they lure you into clicking on their ads and redirect you to malicious websites? Even a “what if” is enough to make a toolbar like this undesirable on your computer if you care about virtual security. Finally, let us provide you with a solution against this annoying malware infection. It is not too complicated to eliminate MyImageConverter Toolbar, but you need to do that in two stages. First, you need to uninstall it via Control Panel. Second, you need to reset your browsers to get rid of the extensions and the Ask.com settings as well. Keep in mind that it would be best to run a malware scan on your system to make sure there is no more threat endangering your computer. Tap Win+R and enter Control Panel. Press OK.
Click on the unwanted application and press Remove. Press the Windows button on the Taskbar. Click on the unwanted application and click Uninstall. Press Win+X and go to Programs and Features. Tap Alt+T and choose Internet Options. On the Advanced tab, press Reset. Mark the Delete personal settings checkbox and press Reset. In the confirmation window, press Reset. Tap Alt+H and open Troubleshooting Information. Click Refresh Firefox and click Refresh Firefox again in the pop-up. Quick & tested solution for MyImageConverter Toolbar removal.